Messerschmitt Bf 108 Taifun in detail. Well, some might say it's a Nord N.1002 Pingouin II as it was built in France, but I have been reliably informed that this particular aircraft was first constructed by Messerschmitt in Germany in June 1944, the date 6th August is associated with it, but I'm not sure whether this is its roll out date or first flight or what. It saw Luftwaffe service, was damaged at some stage, a crash perhaps, then it went to France, where it was rebuilt there and completed in March 1945. In France it was designated as a Nord 1000, Construction Number 107 but after a second crash was refurbished again and assigned C/n 103 as a Nord 1002 Pingouin II. Some time during the war it was shot down over Belgium, where it was captured there by the Allies in June 1945. All this, of course, despite being rebuilt in France twice, does make it a Bf 108 Taifun with considerable pedigree - a genuine World War Two 'Warbird', as its owner stated to me. Its engine came from a pre-production test bed Piper Malibu. On 23 March 1989, the aircraft was sold to Claus van der Walt in South Africa, where it was registered ZS-WFI. Seven years later it was sold to its owner in New Zealand and was registered ZK-WFI. The changes to the original Bf 108 appearance are plainly obvious in this side view. The exhaust is ducted out of the port, which is one piece rather than individual stacks on the lower nose. In a rear view its original lines become more obvious; the Bf 108 was a very attractive little aeroplane. The IO-540 has dramatically altered the nasal profile of the original; Bf 108s were fitted with either a 210 hp Argus As 17 or 225 hp Hirth HM 8U inverted vee eight engines. In France the Nord was fitted with a Renault 6Q-10 inverted vee eight. 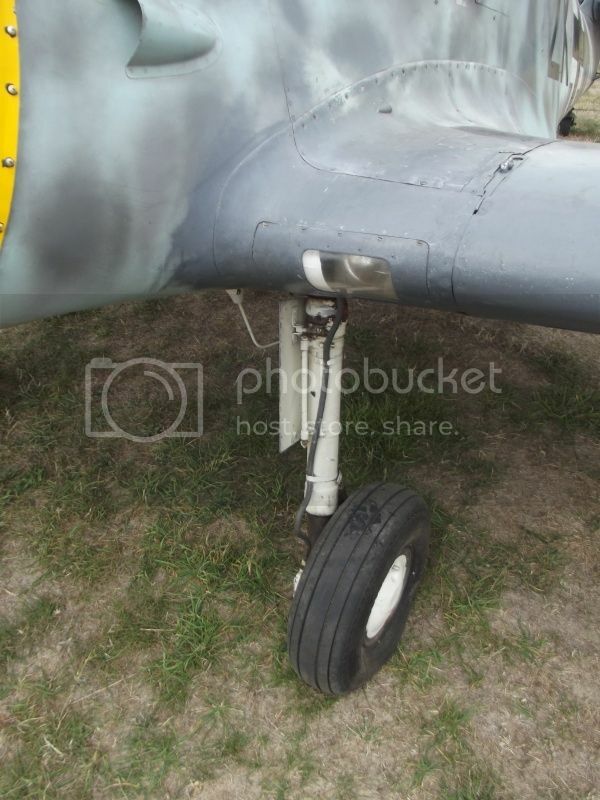 Propellers were usually two-bladed; on the Bf 108A a wooden fixed pitch unit and on the Bf 108 Taifun, either a two-blade fixed pitch or controllable pitch metal unit. The characteristic Messerschmitt leading edge slat application gave the Bf 109 pilots headaches in combat, but for the more sedate Bf 108 gave it excellent flying qualities, improving its short field performance and lowering its stall speed. The slats popped out automatically and did not have any sort of control in the cockpit; you can pull them out of the wing by hand. They would pop out assymetrically in flight at high bank angles. Evidence of its gaudy US applied colour scheme can be seen on the rear of the slat. Very graceful wing to fuselage fairing, with non-slip stripe for access. I was warned about damaging the flaps when getting on to the wing. The empennage is all Messerschmitt, with its hori stab bracing strut and horn balanced elevator. Top view of the fabric covered elevator; note the absence of trim tab, but prominent ground adjustable tab on the rudder. 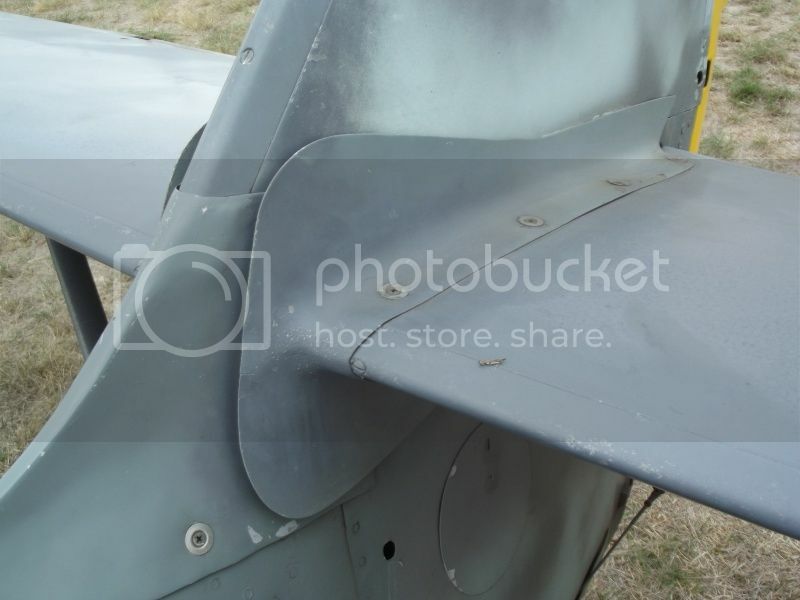 Fabric covered rudder with horn balance at its tip and position light on its trailing edge. A closer look at the aircraft's rear, with the tail wheel and rudder actuation cable visible. 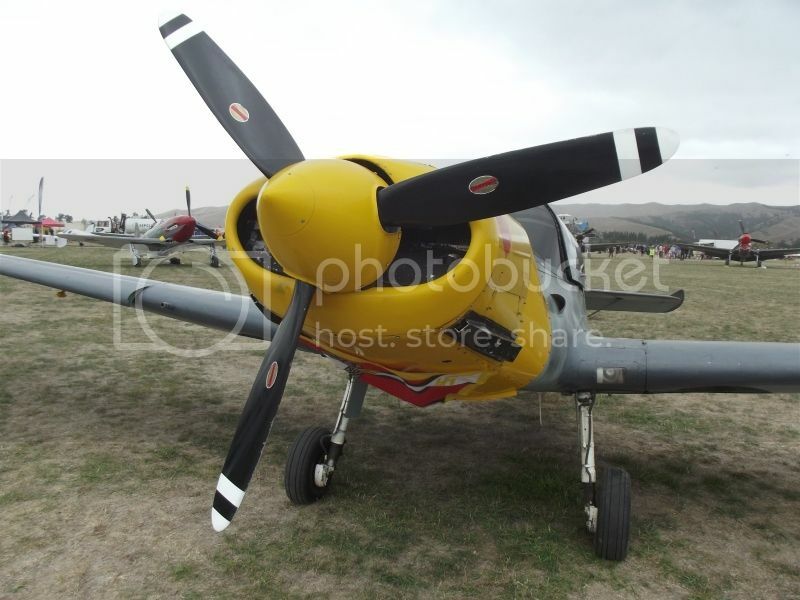 Its tail wheel is non retractable. the whip aerial is a concession to modern avionics. In place of an elevator trim tab, the Bf 108 was fitted with a variable incidence hori stab, which worked reasonably effectively in a light aircraft in which greater trimming in flight isn't always necessary. In a high speed fighter such as the Bf 109, which adopted the same system, the variable incidence tailplane worked well - the Sopwith Pup had one, but without any other in-flight trimming means, flying could become tiresome for the pilot. Note the shape of the fairing and the gap between it and the fin. 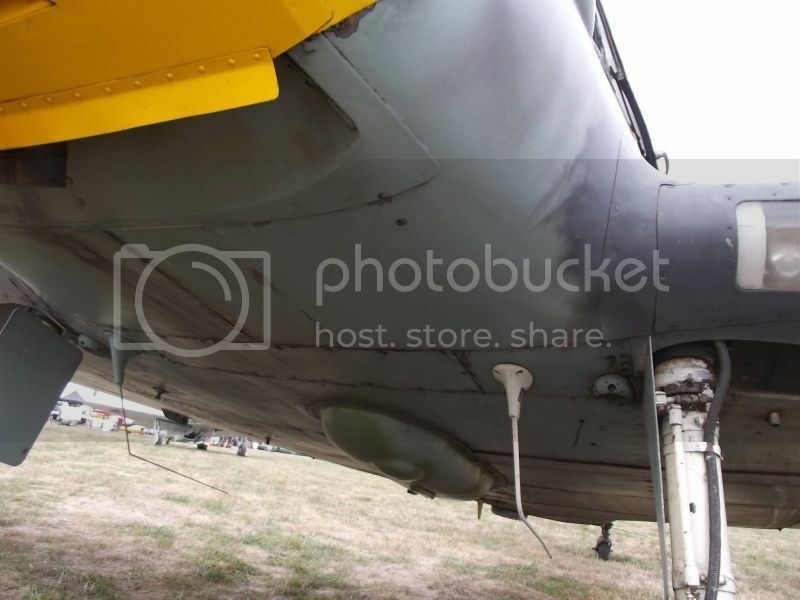 Keeping it authentic; fuel octane rating in yellow triangle as on the fighter its attempting to emulate. Hold with catch open forward of the refueling receptacle. Note the hand hold for accessing the cockpit. A full instrument panel with extras that were science fiction for wartime Bf 108 pilots; little remains of its original instrumentation. I was told that a couple of instruments on the right hand side are original German, but the most are modern American. 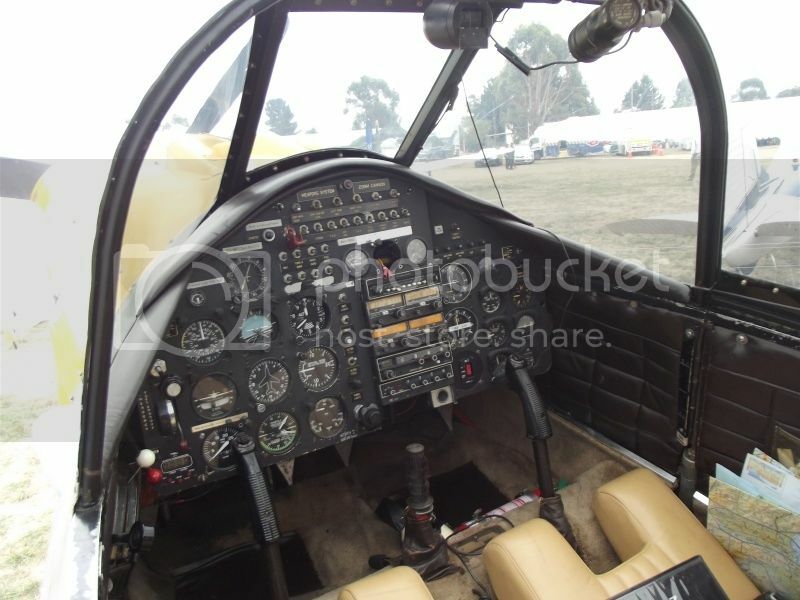 The aircraft is fully IFR capable with the usual avionics fit. The two rows of switches at the very top of the panel activate the guns and smoke apparatus. Note the very good visibility from the cockpit; the quarter lights making up for the direct view ahead on the ground being obscured by the nose. 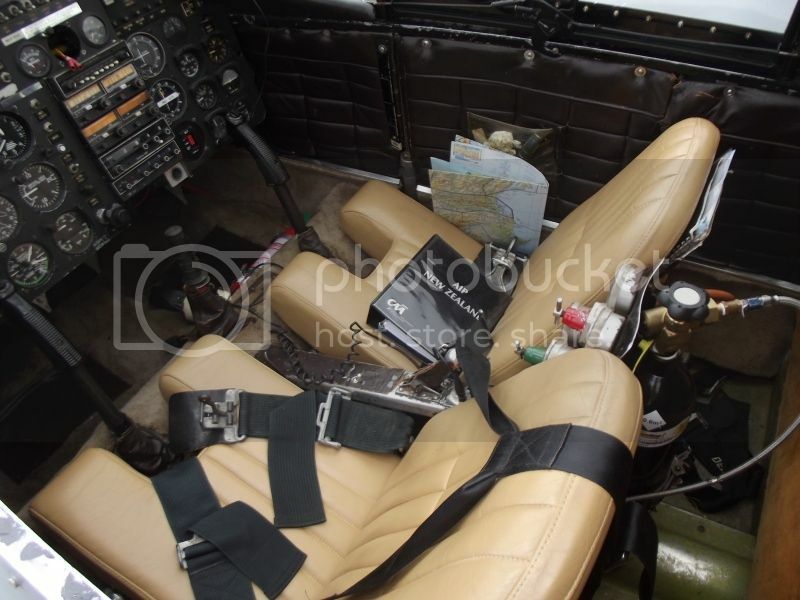 Seats have been recovered and shoulder harnesses fitted. 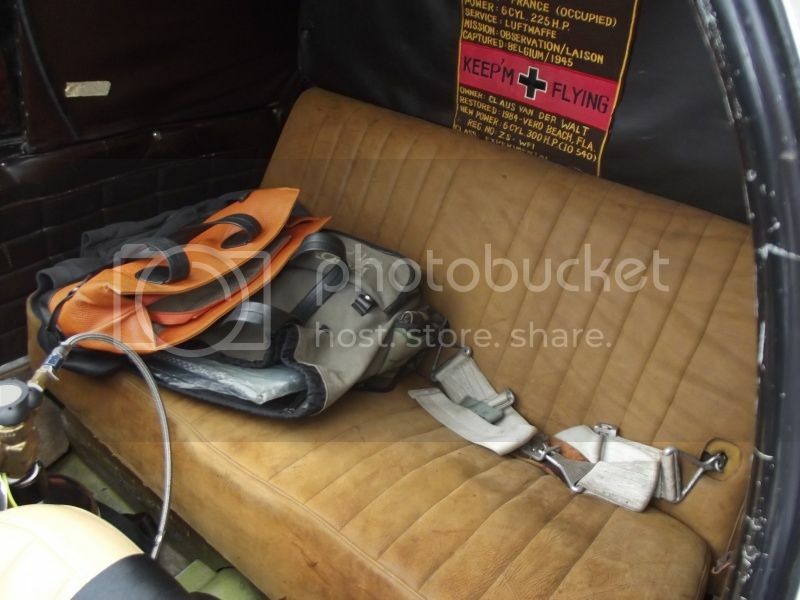 Note the oxy bottle between the seats. 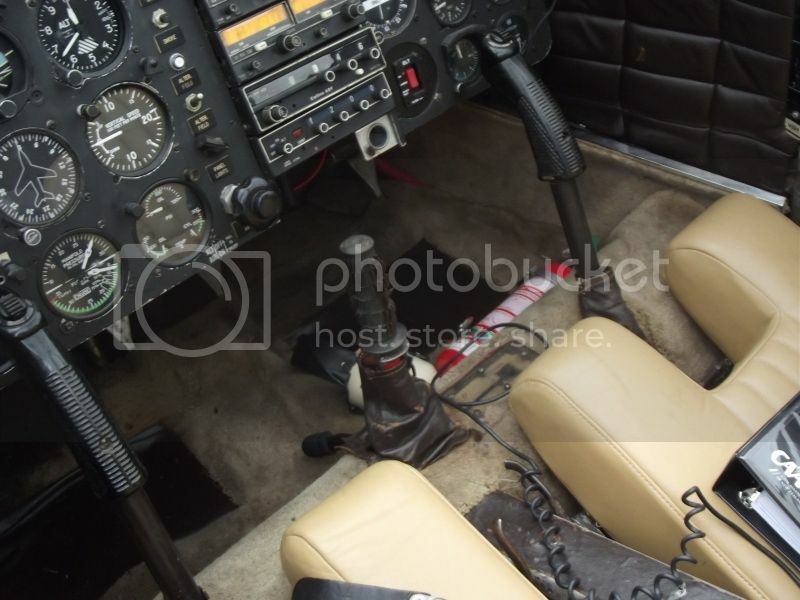 Joy sticks and undercarriage hand pump in the centre console. This was a wobble pump; the gear being actuated pneumatically by moving this backwards and forwards (side to side? ); the gear up/down status is visible in the window on the floor to the right of the handle. 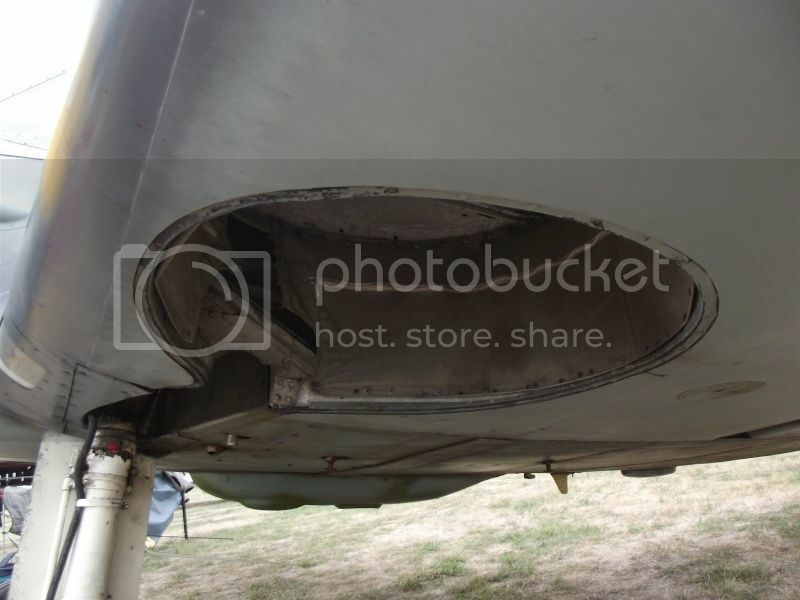 A wee problem in this is that plenty of time is required to raise and lower the gear, otherwise it wont move fully through its travel, also, airflow over the underside provides an extra force against the undercarriage doors, which initially requires considerable pump action to lower the gear. 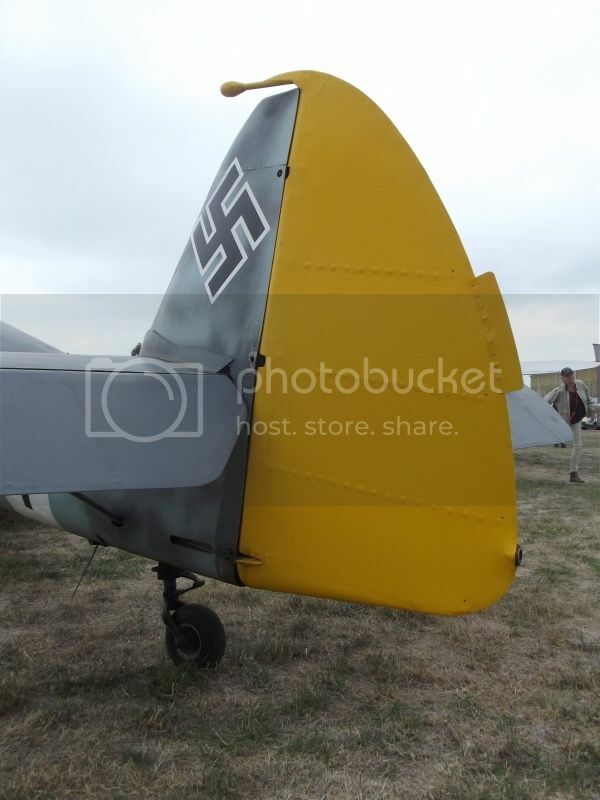 The novel Messerschmitt flap and trim wheels on the left hand side wall. This system is actually quite effective in trimming the aircraft during flap operation; winding the wheels aft simultaneously lowers the flaps and alters the tailplane incidence, maintaining trim without messy ballooning in flight, and vice versa for raising the flaps. The trim wheel can be wound without winding the flap wheel however - they are not interlinked. The same system was fitted to the Bf 109. 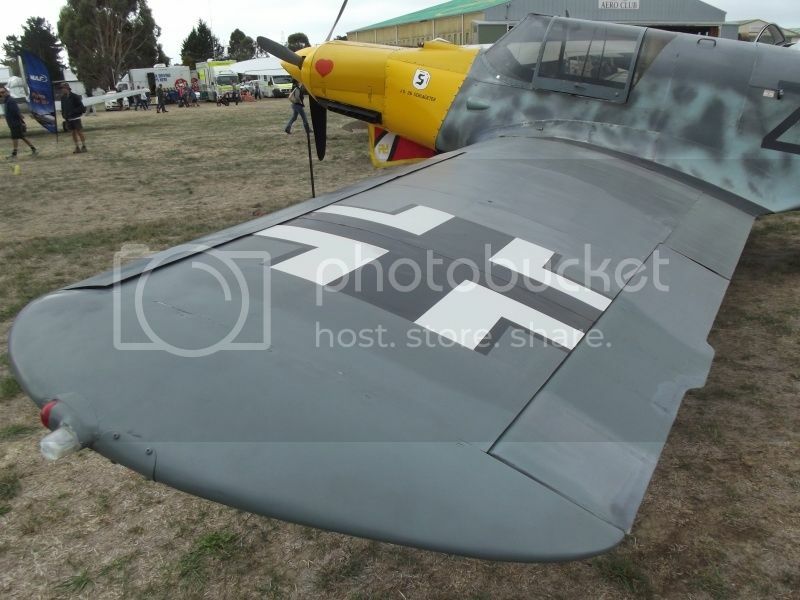 Rear seat; when unveiled in 1934, the Bf 108 was the last word in modern, fast, light aircraft - the first of all-metal construction with trailing edge flaps, leading edge slats, retractable undercarriage and controllable pitch airscrew on later variants. Its three pax sat in considerable comfort with a good view of the world going past rather quickly outside at a cruise speed of 165 mph, quite respectable at that time for a light single. The Bf 108 wouldn't look out of place on flight lines today - except dressed as a faux fighter like this one, of course. The banner, which the owner's wife proudly showed me. This was added when it was refurbished in South Africa. Dimensionally the Bf 108 is quite small, but by comparison with its fuselage size it has a generous wing area of 176 sq feet. The wing was a single spar design, attaching to the fuselage in two places. Fabric covered aileron with fixed trim tab prominent. Main undercarriage leg and landing light. Another is located on the right hand wing in the same place - both gear leg and landing light (!). 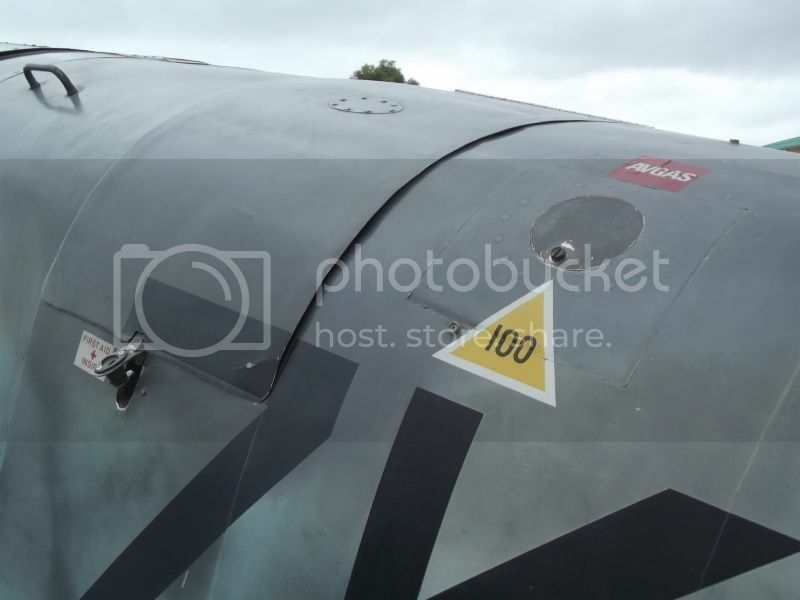 Bf 108s originally had the landing light mounted in a bulbous external fairing midway along the underside of the port wing leading edge. 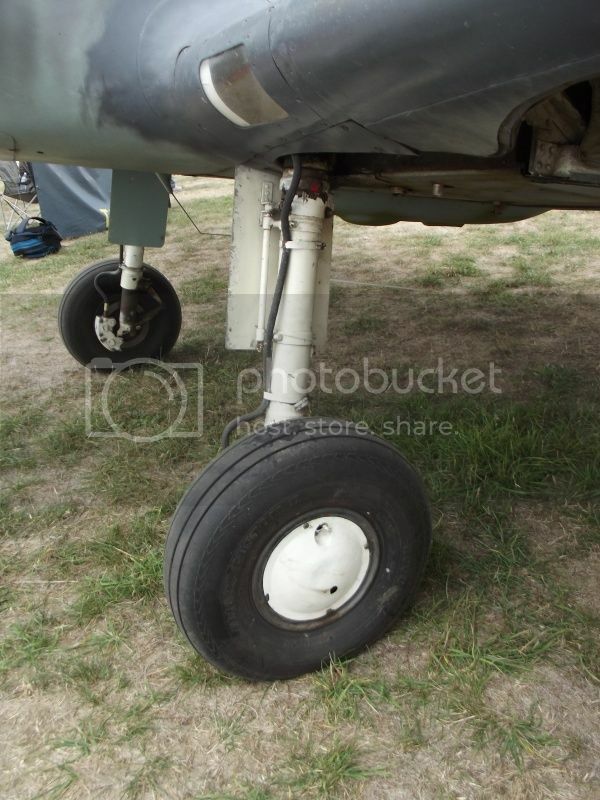 Note the angle at which the wheel is canted, this is opposite to that of the Bf 109, on which the lower tyre rim in contact with the ground was toed further outwards than its top, resulting in tricky handling on the ground. The intake on the fuselage side is for cabin air. 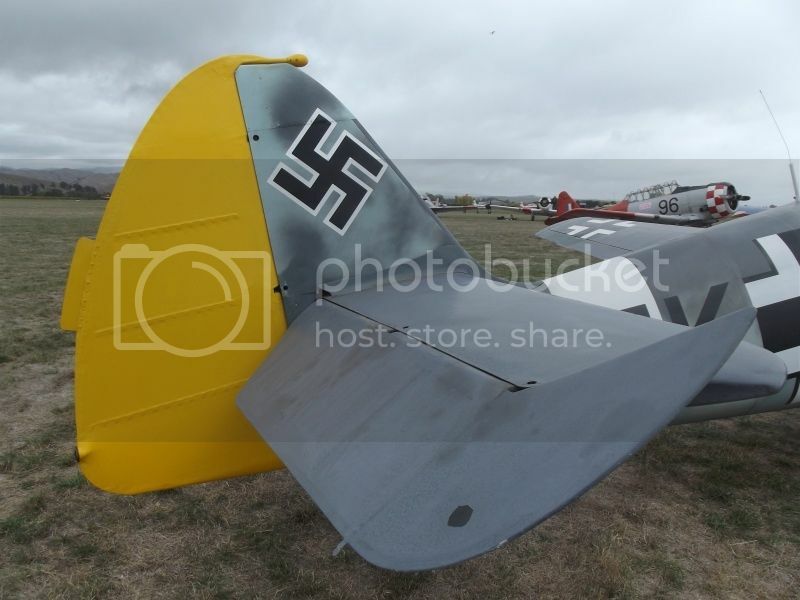 The gear retracted outwards into the wing, which unfortunately gave the Bf 108 a rather narrow track. 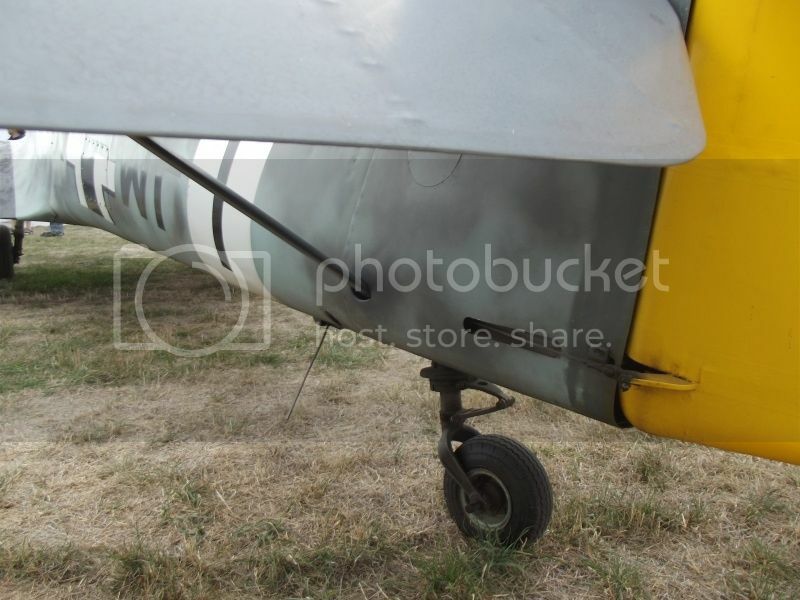 The undercarriage doors have been modified, as Bf 108s originally had full length doors with circular wheel covers. This aircraft has pneumatic brakes installed on each wheel assembly. The undercarriage bay completely encloses the gear, although without the circular wheel cover on the lower leg door, the wheels are visible. 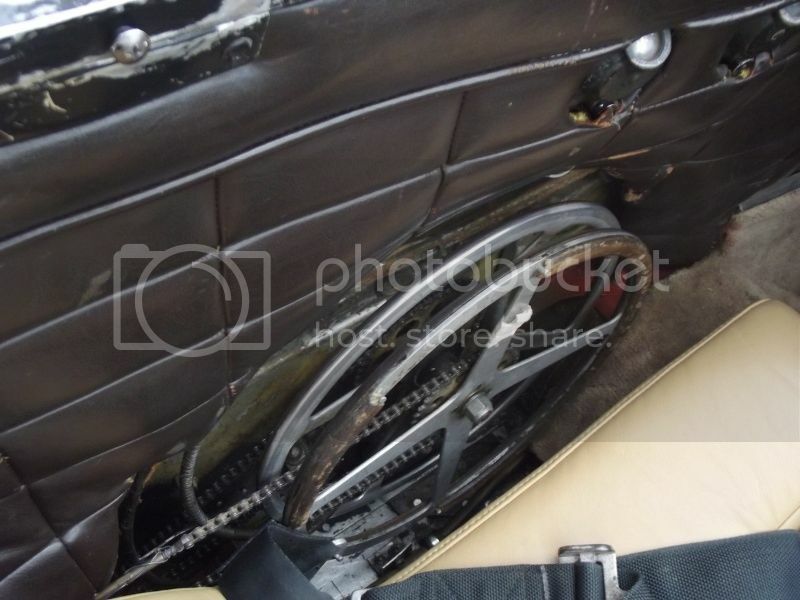 I suspect the lower gear doors were removed because of the installation of the brakes. The wheel well is lined with canvas as its side walls. 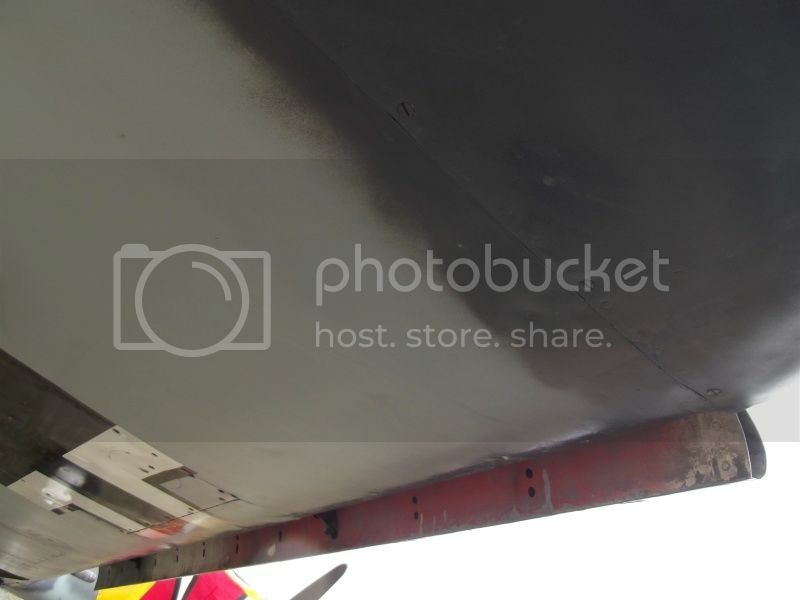 This prevents debris from entering the wing cavity. The zip is for access. The top of the bay is the top wing skin, with longitudinal stiffeners. Finally, a look at the aircraft's belly. Two prominent radio aerials visible, with an underside fairing with an unknown purpose. 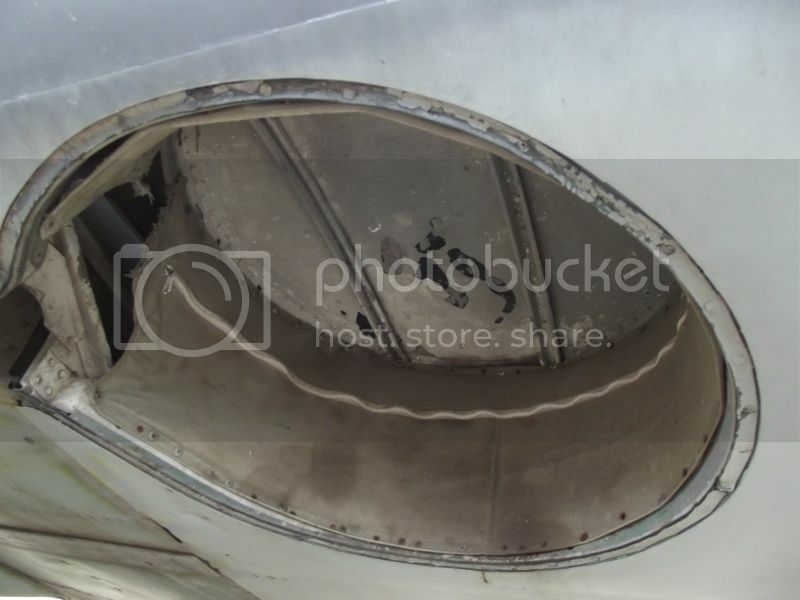 At left is the nose cowl; the cavity being the radiator/oil cooler air outflow orifice. Thanks for looking; I've deliberately left out the nose and canopy, which in my opinion spoil the type's good looks, regardless of the benefits the more powerful and reliable engine and modified tinted canopy with reduced bracing offer to the pilot. It's still a Messerschmitt, though. Great photos. 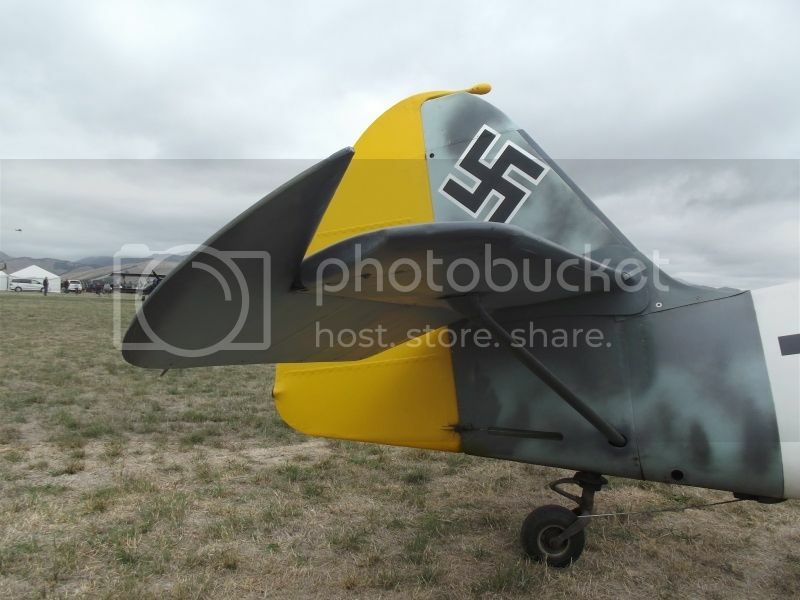 Yes I thought it was well known this was a genuine Messerschimtt-built Bf108. It was rebuilt by Nord after some damage still during the war I believe. 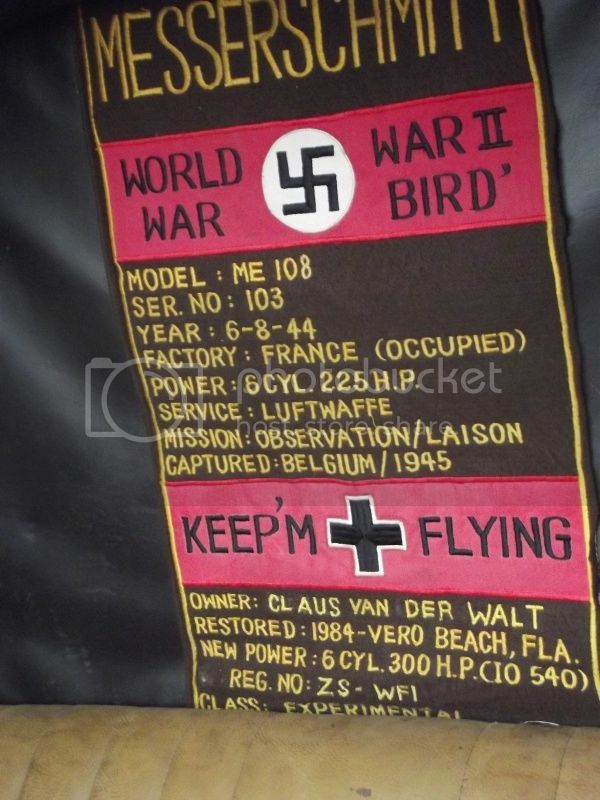 But it's a genuine Luftwaffe baddie. Great walkaround, a massive help to anyone making a model of this well-known machine. Ever since it arrived on the scene I've wanted to build a model of it...one day, maybe. Thanks for sharing. No worries, guys. I've had a good look around the Deutches Technic Museum's Bf 108 once it was on an outing at Duxford too; it has its original canopy and vee 8 engine, so looks quite different to Colin's, but it was neat to be able to scrutinise the aircraft up close. there is a 1/72 Heller kit around isn't there? Here is the Deutsches Technical Museum's Bf-108 at home. Here is the Lufthansa Bf-108 visiting Duxford in 2004. 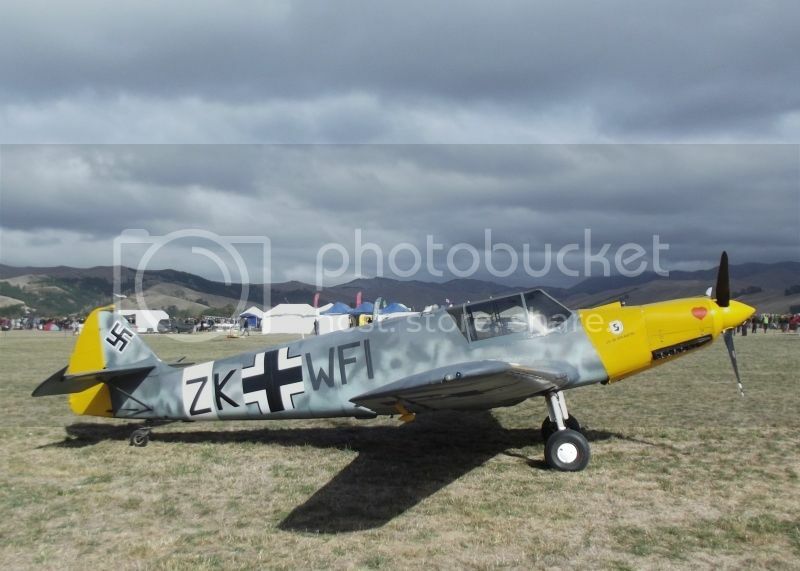 Benno Herrmann's Bf-108 arriving at Hahnweide in 2009. To round out this post, here is Joachim Schulz's Nord 1002 RNZAF Roundel Penguin. 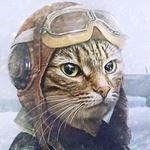 I was at that airshow. Flying Legends 2004. 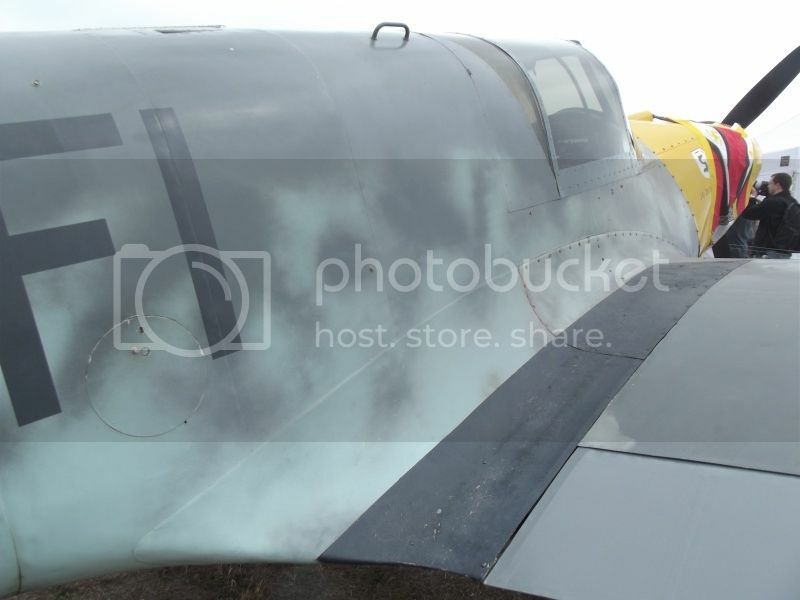 Looking at your last two shots, Brett, you can see the differences in nasal profile between the Nord Pingouin and the Bf 108. A good reference source is the book by Jan Forsgren; there's one on Trademe right now. Harry: there is, as well as an Eduard kit in 1/48. My plan would involve extensive bashing around the canopy and nose though. 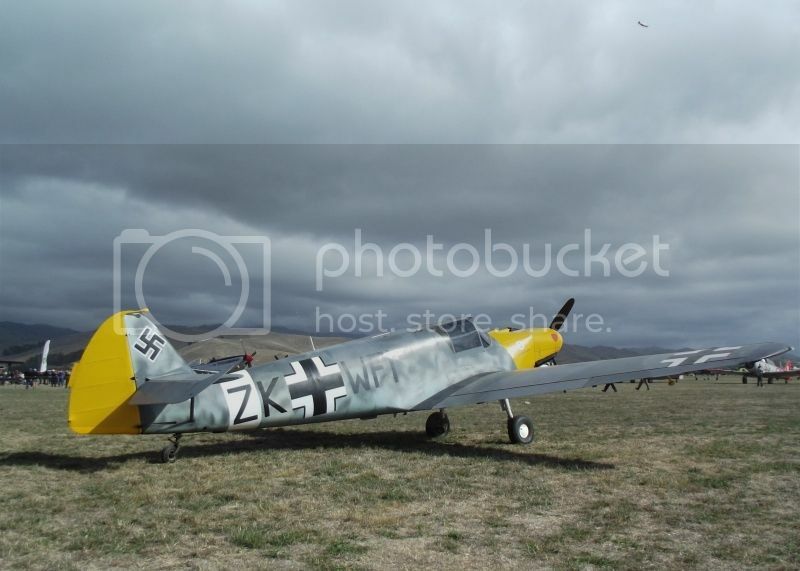 The RAF flew a number of the Bf108's during WWII too, and lots of RNZAF pilots got the opportunity to fly them. They did indeed, Dave; civilian Bf 108s impressed into RAF service at the outbreak of war were named Aldons. 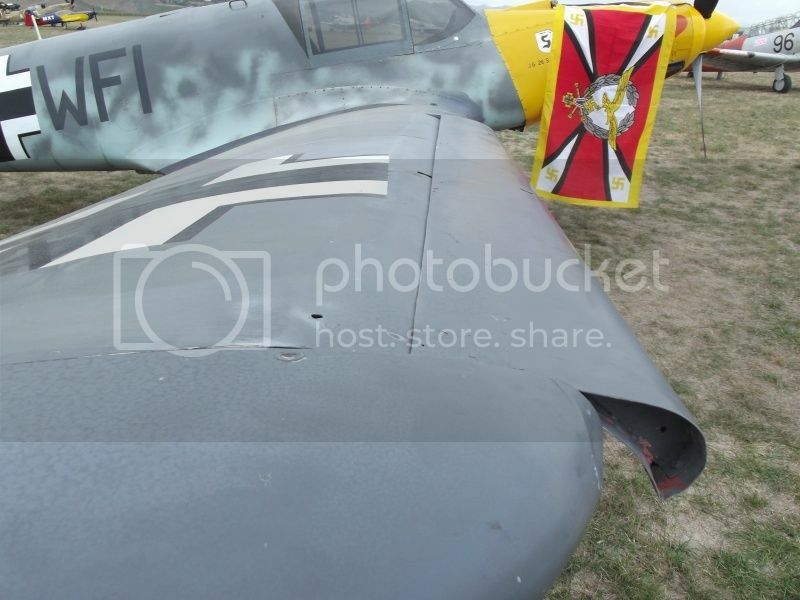 I just remembered, there was an apocryphal story about a Luftwaffe (or Luft Dienst - Air Service) Bf 108 that got lost and crashed in Belgium in April 1940. The Germans were somewhat anxious to get it back and the Belgians were very polite in returning it. Although if they had searched the aircraft they might have been a little less welcoming; inside a brief case in the aircraft were detailed plans for the forthcoming May invasion of Belgium, the Netherlands and France!